First bike and one of the great loves of my life. 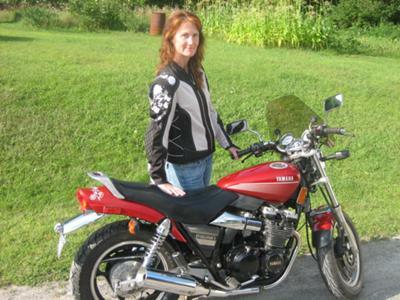 After riding on the back of my brother's Honda CBR 1000, I decided I wanted to learn to ride. I had no prior experience and in my 40's, I took the MSF's class last summer and got my license in mid July. By August I found the Radian in the want ad digest and turns out it was right in my own hometown. I took one test ride and loved it. Totally stock, unmodified and in super condition. The only thing I did to it was to "girlify" it a bit with matching vinyl reflective decals on my helmet and fenders. Can't wait for warm days and clear roads...so many great country roads here in the Adirondacks! Wow, haven't been here in a while. Been riding almost 4 years now?? ?and I don't have the Radian anymore. Great bike, but I got a chance to buy a 02 Ducati Monster 620ie. Fuel injected, bigger tank, bigger cc's, lighter and more nimble. Named her Baby.Interestingly, I am the 2nd female owner. Hope all of you are having a safe and fun summer. Nice Bike... Hope you are having a blast.